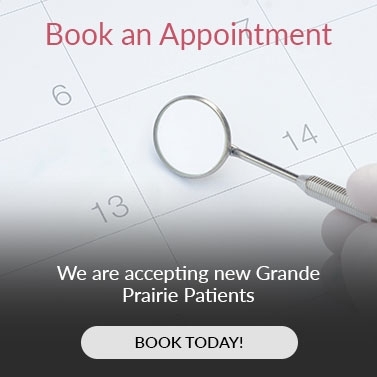 We are always welcoming new patients at Prairie Mall Dental Clinic in Grande Prairie! Contact our dental office to learn more about our practice or book your appointment today. At Prairie Mall Dental Clinic, we want your first visit to be the first of many. It's hard to believe we've been serving the Grande Prairie community for more than 20 years! We understand that your first visit can be overwhelming which is why if there's anything we can do to help make your visit more relaxed or less stressful – ask. We are happy to help! Our goal is to provide you and your family with the dental care you deserve in a friendly and warm environment. We want to give you the tools to help prevent dental disease and aim to be a place that you and your kids enjoy visiting. During your first visit at Prairie Mall Dental Clinic, our dentist and dental team will review three key areas to will give us a clear picture of your oral health and your needs. This information will help us develop a personalized treatment plan for you. Firstly, we will review your dental and medical care history as well as any concerns you currently have with your oral health. We will then perform a complete oral exam, including X-Rays to help us assess the overall health of your smile. Finally, we'll prepare recommendations for your total oral health, which will include at home oral health maintenance, as well as potential dentistry services that we agree upon. At Prairie Mall Dental Clinic, your oral health is our number one priority. The more you understand the better able you'll be to make informed decisions about your ongoing oral health. We strive to effectively educate and communicate with all of our patients and will do our best to keep you fully informed about your oral health, your dental treatment options, and your financial responsibilities.